Shirts With Random Triangles: Houston Celebrates Easter With Circle Drills In...Bunny Suits? Houston Celebrates Easter With Circle Drills In...Bunny Suits? WTF, Houston? Image via @SBNationCFB. Hope you all are having a Happy Easter, and remember why we celebrate it today. With that out of the way, on with this absolute WTF moment from Houston spring practice, where somebody decided to celebrate Easter by having two people in bunny suits fight it out during circle drills. No, I'm not kidding. Bunny Suits. It was like someone decided to see what would happen if Donnie Darko and Harvey the Imaginary Rabbit decided to duke it out in Easter Bunny Fight Club. 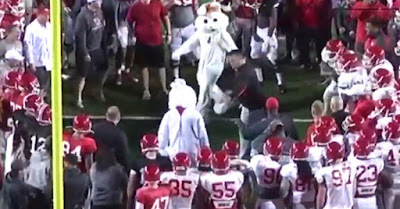 Houston head coach Tom Herman was even proud enough to share video from Houston Easter Bunny Fight Club on Twitter. There's no word if these rabbits in disguise were players or not.